This pattern is available from knittingtraditions.com for $8.00. 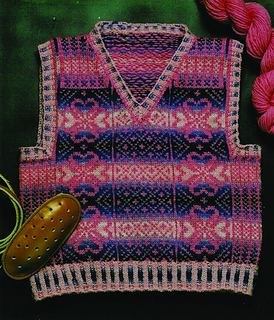 This pullover vest is knitted in 8 colors. The square armholes and V-neck are steeked. The vest appears complex, although the main color remains the same throughout, making it easier to work. The background shading changes every 2 to 3 rounds. There are four colorway suggestions based on the colors Brown Sheep carries, but you are invited to try your own combinations! Worked in Nature Spun Sport Weight yarn. The gauge is 36 sts and 36 rnds/4 inches in stranded two-color St st.